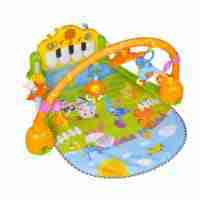 The Mini Me And Friends Play And Learn Activity table is a great way of encouraging play and learning for your little one. Lights, sounds and music and highly interactive toys such as the train track keep your baby or toddler engaged and most importantly entertained. 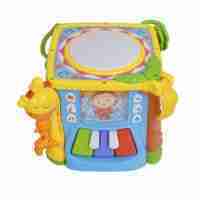 Great colourful toy with lots of different activities. Bought this for my granddaughter who loves it. I received they you and its absolutely great. A bit too high for my 10 month old so I took legs off. Surprise but for the price paid no batteries left. Some would leave 5 stars maybe more but it does spoil fun if you don’t have any at home and your kid can’t play because seller can’t be bothered to put 3 batteries that cost ?2. It has a small trafic light which I have to becareful my baby doesn’t fall with his face on it as he has only began to stand so he often fall while standing and playing. Also one of the legs had scratch on it. Over all very good and interesting features. Good little activity table. Different from your usual phone, flip book ect. Just a shame that many of the stickers came off on the first day. My little girl loves it! It?s great that it comes off the legs too as she plays with it both ways! So much learning on there for her too! My granddaughter loves it! When she is playing on it she is so focused, it’s really cute to see. 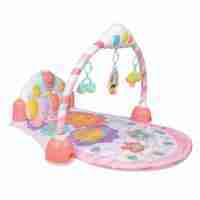 Great activity play table. 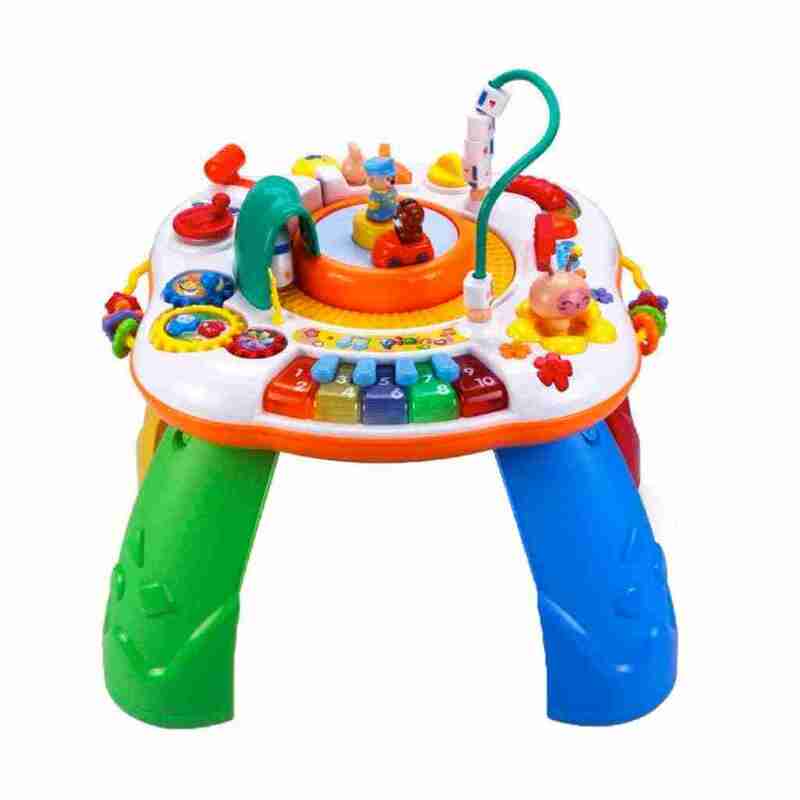 A sturdy and colourful play table with interesting gadgets, especially for little travellers – there is a high speed train with sound effects just like what you?d expect to hear at a train station, and a car that joins the convoy when you rotate a wheel. There are a number of rotation and sliding buttons, switches and dials; the worm munching away whilst crawling longer and shorter is cute and informative. 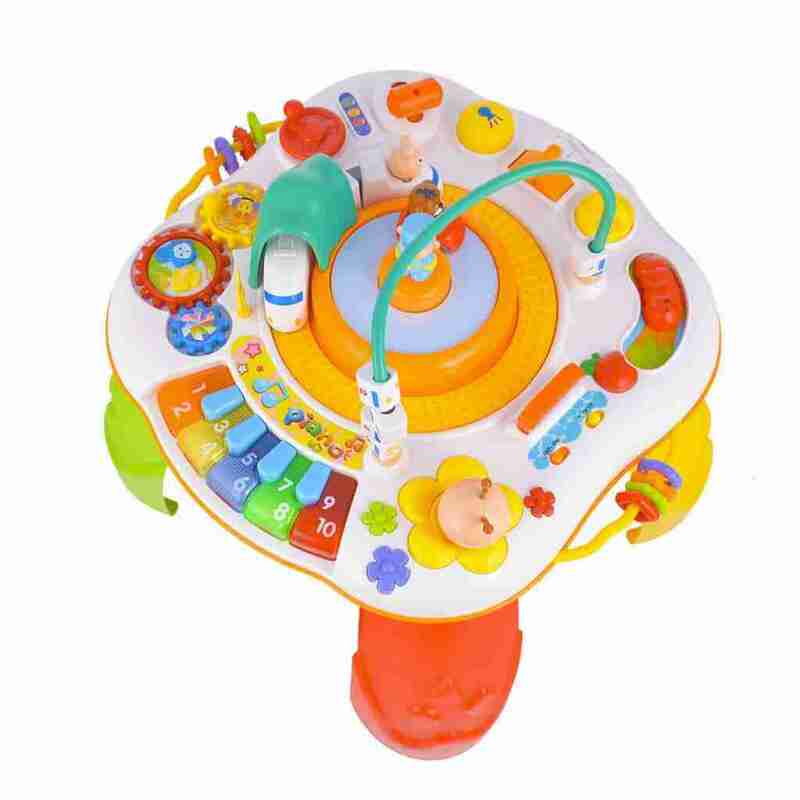 It also has musical elements like the keyboard and various songs, and learning counting with voice promts and an abacus, which is also great for hand eye coordination. It?s definitely value for money. Bought for our 1 year old daughter, she loves watching the motorised train go round and play on the piano, several moving parts and very well made! She hasn?t left it alone since she opened it on her birthday. She loves it and hasn’t left it alone since. Very well made with plenty of lights, buttons and moving parts to keep her entertained. Sturdy yet easy to put together. Best part is the three volume settings so it doesn’t have to be too loud ?. Before:The train doesn?t work, the simulation sound is always the same and for the medium/higher volume settings the simulation sounds gets locked and the table needs to be resatrted, tried to figure output the problem and no one from the seller replied. Apart from this, everything works perfectly and my baby loves it. Placed a question about the train not working and didn?t have any reply. I am not happy because the problem with the train get annoying as the simulation sounds get locked and nothing more works and I have to restart the table, so I have to constantly near. The train also doesn?t move, apart from this everything works. Cant fault it. My lo loves it. Quick delivery. Very sturdy. Would recommend! Great product, my baby loves this. My 14 month old loves this. The sounds and colours are great. It’s a nice activity centre, but my 11 month babies were able to break some small parts and if I hadn’t seen then they would have easily put them in their mouth and choked. Even the stickers for train signals and on-off/volume buttons were easily peeled by the babies! Hence feels little cheap for the money you pay. Great toy. My little one really like it. Bit small but good for babys which yet not walking. Play all day with Mini Me & Friends! 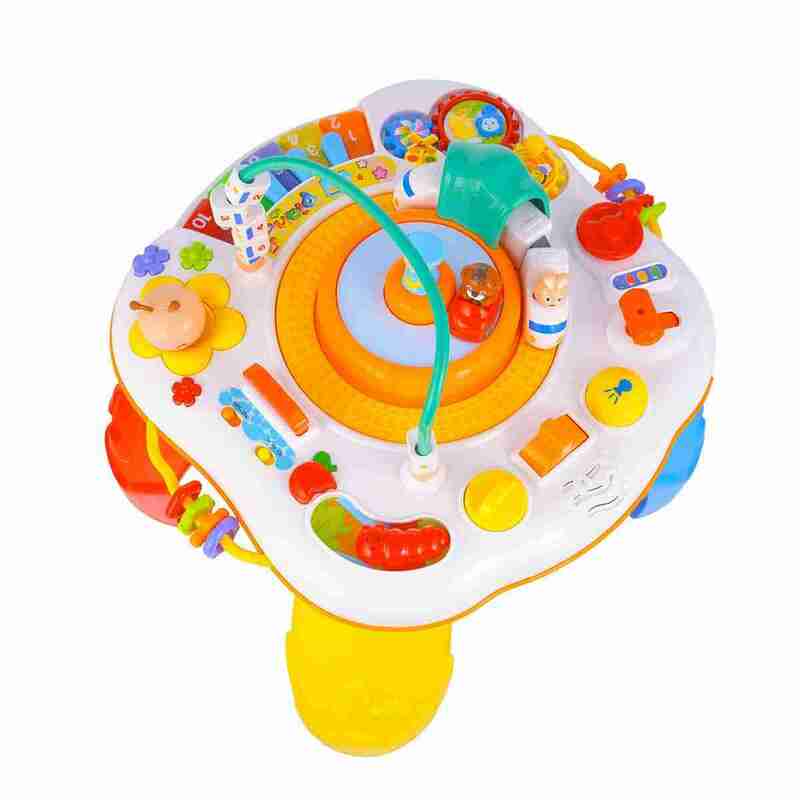 The Mini Me & Friends activity and play table is packed full of toys and features to keep your little one entertained. Switch modes on the 3 in 1 play piano to let your little one explore sounds, numbers and letters at their pleasure. There’s also the interactive railroad turntable that travels around the center of the table complete with lifelike train sounds! As your baby grows so does their curiosity, and before you know it their standing! 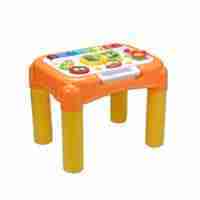 The Mini Me & Friends Activity Table has two ways to play, you can either lay it down on the floor for seated playtime or it can be stood up with legs providing your little one with some much needed support as they begin to stand on their own two feet.